Agrasen was a legendary Indian king (Maharaja) of Agroha, a city of traders. The Agrawal and Rajvanshi communities claim descent from him. He is credited with the establishment of a kingdom of traders in North India named Agroha, and is known for his compassion in refusing to slaughter animals in yajnas. The Government of India issued a postage stamp in honour of Maharaja Agrasen in 1976. 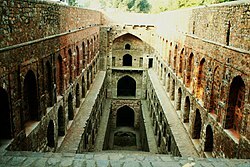 Agrasen ki Baoli in Delhi. The current structure was built in the 14th century by the Agrawal community, which traces its origin to King Agrasen. It is believed that the original structure was built by the king Agrasen during the Mahabharat epic era. The Agrasen legend can be traced to Agarwalon ki Utpatti ("Origin of the Agrawals"), an 1871 essay written by Bharatendu Harishchandra (1850-1885), a noted Agrawal author and poet. He claimed to have compiled the legend from "tradition" and "ancient writings", especially a text called Sri Mahalakshmi Vrat Ki Katha. He stated that Sri Mahalakshmi Vrat Ki Katha was contained in the Bhavishya Purana, which exists in several recensions. However, independent researchers have been unable to find the legend in any version of Bhavishya Purana. In 1976, the Agrawal historian Satyaketu Vidyalankar published a copy of the Mahalakshmi Vrat Ki Katha in his Agrwal Jati Ka Prachin Itihas ("Ancient History of the Agrawal caste"). He stated that he had found this copy in the personal library of Bharatendu Harishchandra. However, the text does not contain any clue about its origin. Agrasen was a vysya king of the Solar Dynasty who adopted Vanika dharma for the benefit of his people. Literally, Agrawal means the "children of Agrasen" or the "people of Ag", a city in ancient Kuru Panchala, near Hisar in Haryana region said to be founded by Agrasen. According to Bharatendu Harishchandra's account, Maharaja Agrasen was a Suryavanshi Kshatriya king, born during the last stages of Dwapar Yuga in the Mahabharat epic era, he was contemporaneous to Lord Krishna.He was Son of King Vallabha dev who was Descendant of kush(Lord Rama's Son). He was also descendant of Suryavanshi King Mandhata. King Mandhata had two sons, Gunadhi and Mohan. Agrasen was the eldest son of the King Vallabh, descendant of Mohan, of Pratapnagar. Agrasen fathered 18 children, from whom the Agrawal gotras came into being. Agrasen attended the swayamvara of Madhavi, the daughter of the King Nagaraj Kumud. However, Indra, the God of Heaven and also the lord of storms and rainfall, wanted to marry Madhavi, but she chose Agrasen as her husband. Because of this, Indra became furious and decided to take revenge by making sure that Pratapnagar do not receive any rain. As a result, a famine struck Agrasen's kingdom, who then decided to wage a war against Indra. Sage Narada was approached by Indra, who mediated peace between Agrasen and Indra. As per the advice of Maharishi Garg, he also married Sundaravati to increase his wealth and health. He is said to have married 17 naga-kanyas. Another belief states King Agrasen to be the elder brother of Shoorsen Vrishni and elder grandfather of Balarama and Krishna Vrishni of Mahabharata, descendant of King Yayati of Khandavprastha. It was built after several attacks faced from Jarasandha of Magadha Kingdom in Mahabharata period. Agroha was called as Agreya in its original period. Agroha was the birthplace of Maharaj Agrasen, and Agra was his kingdom. King Agrasen made it capital of his state, a city in ancient Kuru Panchala, while his younger brother Shoorsen, including Balarama and Shri Krishna decided to stay at Dvārakā. He is well renowned due to his famous policy of one brick and one coin. It is said that one who came to his kingdom, to be a citizen, was given 1 brick and 1 coin by every other resident. The coins he would end up with, would provide money to set up a new business(thus ensuring his income) and the bricks would help him build his house. Agrasen traveled all over India with his queen to select a place for a new kingdom. At one point during his travels, he found a few tiger cubs and wolf cubs playing together. To King Agrasen and Queen Madhavi, this was an auspicious indication that the area was veerabhoomi (land of the brave) and they decided to found their new kingdom at that location. The place was named Agroha. Agroha is situated near present-day Hisar in Haryana. Presently Agroha is developing as agrawal's holy station, having a Big Temple of Agrasen & Vaishnav Devi. Under the leadership of Agrasen, Agroha became very prosperous. Legend has it that a hundred thousand traders lived in the city at its heyday. An immigrant wishing to settle in the city would be given a rupee and a brick by each of the inhabitants of the city. Thus, he would have a hundred thousand bricks to build a house for himself, and a hundred thousand rupees to start a new business. Agrasen divided his kingdom among his 18 children, resulting in eighteen Agrawal gotras. Often, the number of gotras is stated to be seventeen. Another version suggests that Agrasen proceeded to conduct 18 mahayajnas ("Great yajnas"). During one such yajna, Agrasen noticed that a horse that had been brought to be sacrificed was trying hard to get away from the sacrificial altar. Seeing this Maharaj Agrasen was filled with compassion for the animal. The idea of ahimsa (non-violence) grabbed his mind. Therefore, he put a brake to his eighteenth yajna, announcing that no sacrifices will be made in his kingdom in name of yajnas. Thus, the eighteenth yajna wasn't completed and Agrasen had performed seventeen and a half yajnas. The gods appeared before him and blessed him with seventeen and a half gotras. In the later part of his life, Agrasen nominated his eldest son Vibhu to the throne and took up the Vanaprastha ashram. Gradually, the city of Agroha declined and was finally destroyed in a huge fire. The residents of Agroha i.e. the Agrawals moved out of Agroha and spread in other parts of India. It is believed that King Agrasen married Madhavi, daughter of King Kumud of Nagaloka (Snake Kingdom). Thus Agrawals are the progeny of Madhavi and that is why they worship Nagas (snakes) and consider them to be their maternal uncles. Agrawals are basically a trading community involved in various business/commerce. They are one of the most respectable and enterprising of mercantile tribes. Two of Emperor Akbar's famous ministers are said to have been Agrawals, viz, Todarmal who introduced an assessment of land, and Madhushah, who introduced ‘Madhushahi’ pice. ^ "KCR Praises Vaisyas to Skies, Says The Community Knows Art of Life". ^ "Agrasen Ki Baoli". AgrasenKiBaoli.com. Retrieved 4 August 2015. ^ a b Babb 2004, p. 199. ^ a b Singh, Kumar Suresh; B. V. Bhanu (2004). People of India. Popular Prakashan (Mumbai), Anthropological Survey of India (Kolkata). p. 46. ISBN 81-7991-100-4. OCLC 58037479. Retrieved 19 April 2007. ^ "Agrawals". Shri Agrawal Samaj. Archived from the original on 23 April 2007. Retrieved 19 April 2007. Babb, Lawrence A (2004). Alchemies of Violence: Myths of Identity and the Life of Trade in Western India. SAGE Publications. ISBN 978-0-7619-3223-9.